Fresh seafood, great steaks, ice cold beer and friendly staff are just a few of the reasons that Cooters Restaurant & Bar on Clearwater Beach has become a popular place for both locals and tourists. Owned and operated by Barry and Carol Mears, and Amanda Mears Calhoon, the restaurant has been in continuous business for twenty-five years. Over the years, Cooters has become a destination spot for many. “People love it here,” said Carol Mears. 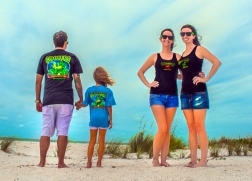 “We have customers that have been coming here for many years. 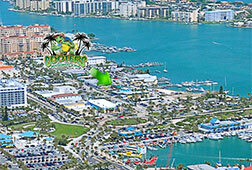 We have our locals that come in on a regular basis, and out-of-town visitors that return every time they come to Clearwater Beach. Many have told us that they make Cooters their first stop as soon as they’re in town”. Cooters originally opened in 1993 as Cooters Raw Bar, and was modeled after a rustic Key West watering hole and oyster bar. In 1997, Barry Mears and a former partner purchased Cooters and started the transformation from a bar with food to a full service restaurant with a bar. They started the now famous “All you can eat Crab Legs Special”, which was an instant success. In addition, they offered fantastic happy hour pricing on favorites such as wings, oysters, and shrimp, and of course ice cold beer. When the space next to the restaurant became available, seventeen years ago, Mears expanded, adding a separate Sports Café, now called Cooters Sports Bar. The sports bar has become a popular gathering place to watch sports on TV, play video games, and crank up the jukebox late at night. The room is also available to book for private parties. The building was built in the 1940’s, and the wood walls and railings give Cooters a warm, inviting atmosphere. The walls are covered with interesting pictures, plaques and numerous license plates. The license plates have all been given to the Cooters staff from customers over the years. “We receive so many license plates each month that we continually have to modify the displays to add the new ones without taking down any existing ones”, said Mears. 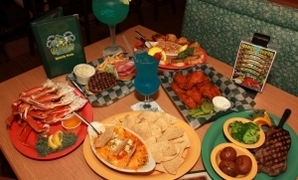 The family friendly restaurant has something for everyone with a broad selection of outstanding seafood, steaks, sandwiches, wings, salads and appetizers. “Our attention to detail is the number one reason for our success”, said Mears. “We’re a bit off the beaten path, so everything we do here has to go above and beyond.“ All items on the menu are prepared fresh in house; steaks are hand-cut and burger patties are made by hand. Fresh seafood is delivered daily. All sauces, dressings and soups are house-made, and the wings are hand breaded to order. 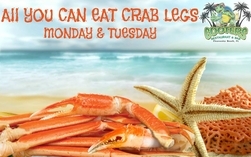 Famous Specials include All-You-Can-Eat Crab Legs (Mon & Tue) All-You-Can-Eat Fish and Chips (Wed), Super Grouper Thursday, Seafood and Steak Specials on weekends, and Cooters legendary daily Happy Hour.